In addition, your ideal work surface is a worktable that is about waist high. 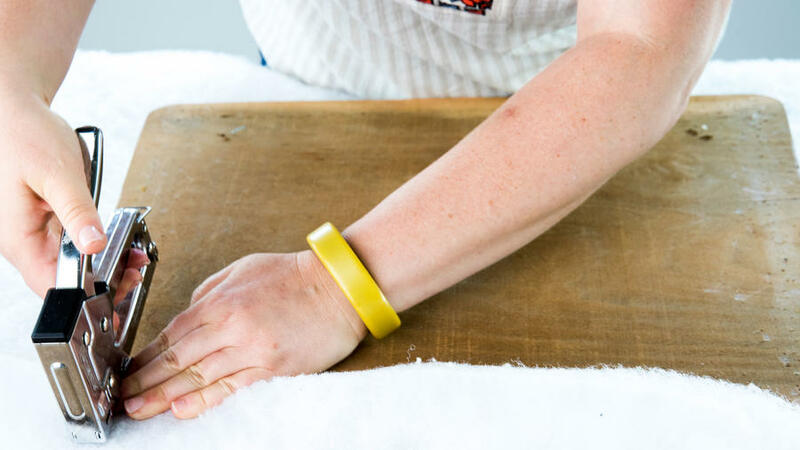 Protect the table with a moving blanket. Flip chair over and remove the screws. Keep the screws even if they are rusted so you can replace them with the correct size. 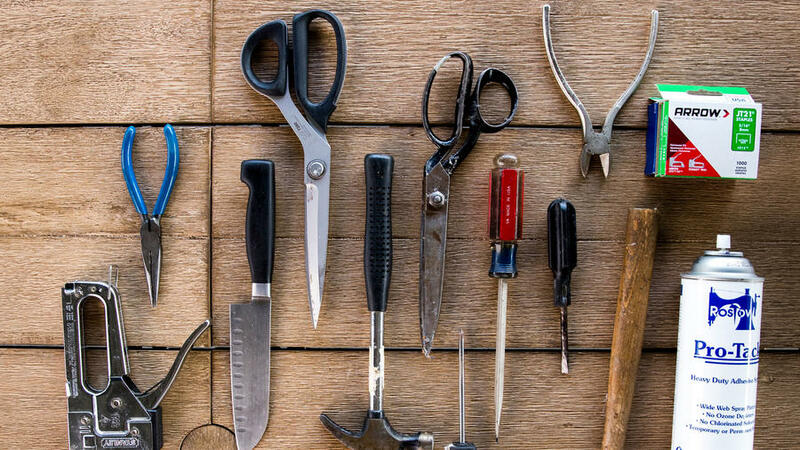 Use a flathead screwdriver or staple lifter to remove staples and tacks. Use the side of a hammer to tap the end of the tool. Go across the wood to get under the staple and tack to loosen it. Try not to gouge the wood when removing tacks and staples. Use pliers to remove loosened staples. Clean off frame for foam and fabric application. If the seat has a frame with webbing, cut out a piece of plywood the same size as the frame of your dining seat. Place a cutting board underneath. 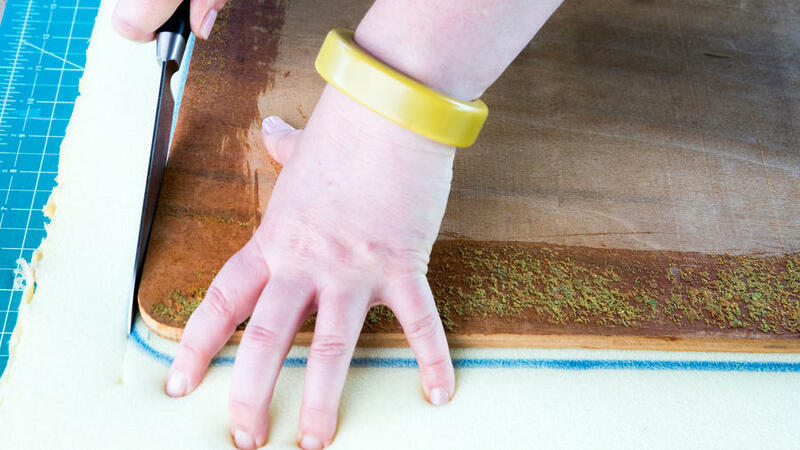 Put the seat on top of the foam, atop the cutting board, and draw out the shape of the frame. Put the knife on the bottom of cutting board and cut the foam towards you, using the chair frame as a guide. For 1”-thick foam, large scissors could work as well. 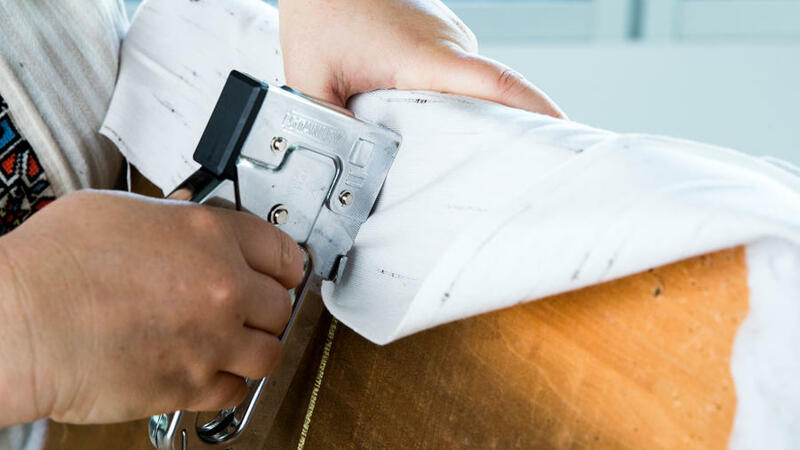 The advantage of using Dacron wrap is that it’ll soften the wood edge to protect the fabric from rubbing and create smooth results without wrinkles. Cut the Dacron so it goes all the way around to the wood. Use the staple gun to adhere the Dacron. Or, when using spray glue, spray and let sit for thirty seconds. Staple the Dacron along the frame every three inches. Cut excess. Staple the middle of one side and then pull toward the other side; then do the other two middles and work your way out to the corners. 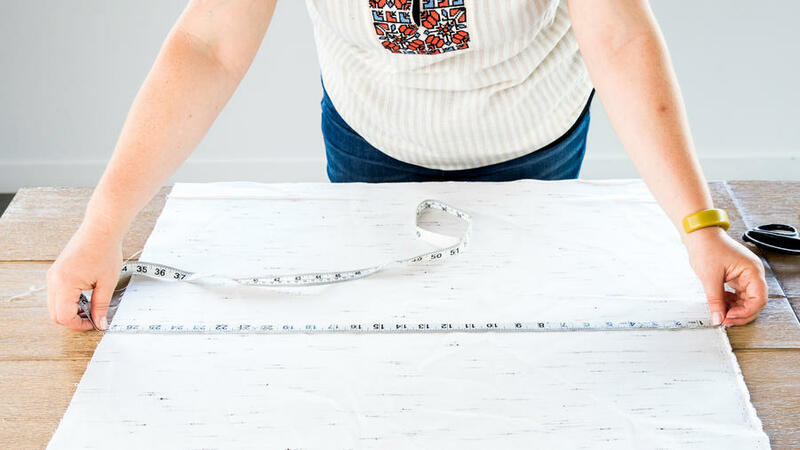 Measure the widest part of the frame front to back and side to side from the wood-to-wood and then add two inches on each side for pull fabric. 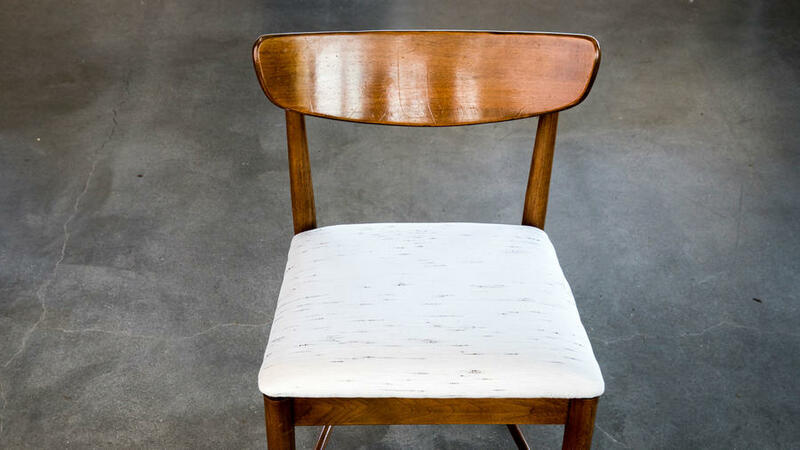 Use chalk to mark the middle of the chair on top and bottom on the underside of the chair. Find the middle of the fabric and cut a triangle on each side of the middle. Staple the front center temporarily so you can do the back of the seat first. 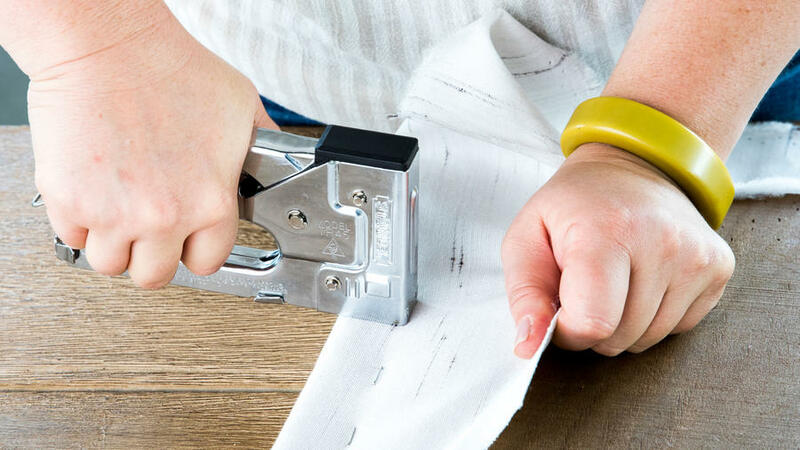 Try to staple one inch in from the side so you have room to staple the dust cloth. Don’t staple over the screw holes. Pull to the center of the back of the seat. 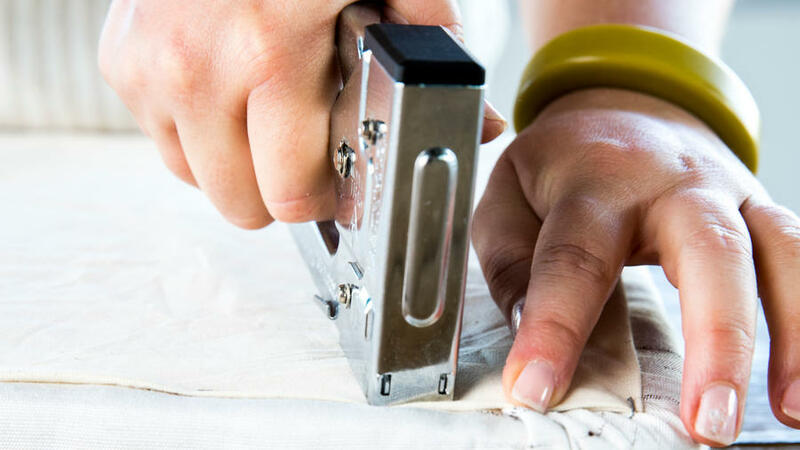 Use your hand to smooth out the fabric on the side. Work your way out to about an inch from each corner. Do the same on the top of the seat. Use your hand to feel across the side for bumps; try to pull at the same amount not to have big bumps. Staple every inch and take out as needed to get a smooth look. On the sides, do the middle first and then work out to one inch from the corners. You have several options for creating the corners. For a rounded wood edge (pictured), pull the middle of the fabric and cut excess fabric. Pull hard at the middle of the corner first, and then continue to pull on the middle and staple until there are no rumples or fabric. Put the first staple on an angle toward the middle. For a square corner, pull the side all the way over and staple. Gather fabric and cut the excess. Fold the fabric under and pull. 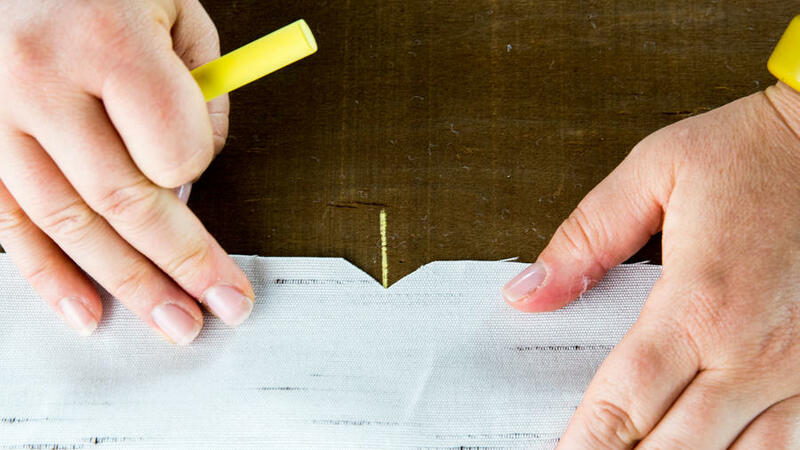 The fold might take a couple of times to create; make sure it looks smooth from the front before you staple. 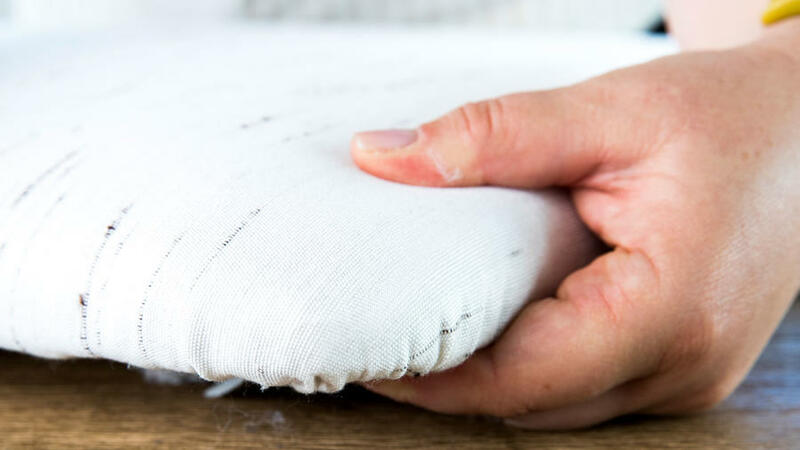 A double pleat is for 2-inch foam or when the fabric is stapled on the side of the wood of the chair instead of underneath. Pull the center first and staple. 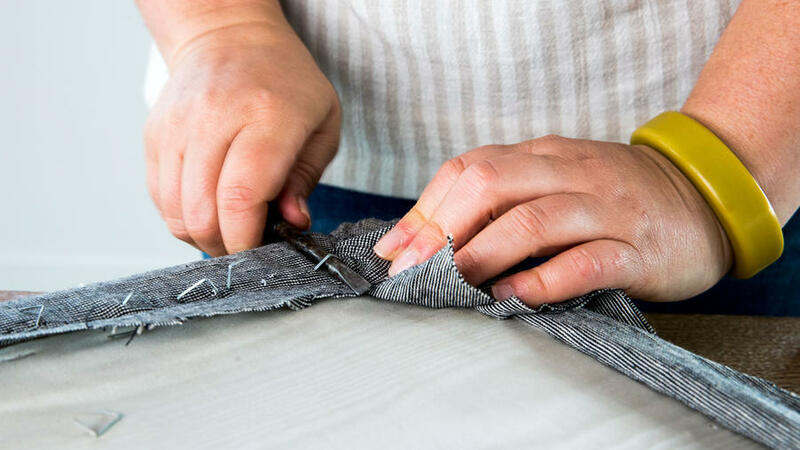 Take the excess on each side and fold the fabric toward the center and staple. Once all four corners are done, cut excess fabric. Cut dust cloth one inch bigger on all sides of the seat. When using leather or vinyl, put holes in the wood so it can compress and decompress without a noisy whoopee cushion effect. Mark the screw holes on the dust cloth. Flip over the chair. Make sure the seat is centered. Put in screws. Upholstery fabric by Sunbrella.